Clean does not hold back. It tackles a broad range of issues including drug addiction, gender identity, eating disorders, mental health and toxic relationships. For me this was the real strength of the novel showing the reader an incredibly realistic account of how deeply such issues can affect those dealing with them. Clean focuses primarily on the story of Lexi. Lexi is an incredibly interesting character. She's super rich and completely spoilt and makes the most benefits her privileged lifestyle brings her. Initially she's one of those characters which you might think you are going to hate meeting her for the first time as she's being carted off to rehab for her drug addiction. However over the course of the book I found myself really getting behind her as I started to understand the real pain she was going through and struggles she had to overcome particularly in regards to the toxic relationships she had been in. One thing this book does particularly well is trans representation. There is a trans character called Kendall. Kendall is a brilliant character in herself. I always found her contributions to scenes to be sharp and witty. The portrayal of her struggles with her eating disorder are put across in a thoughtful way. However why I particular loved Kendall is just because she's there. She's there and the fact she is there isn't a big deal. She interacts with Lexi in such a normal way and Lexi in return just accepts her for who she is. There's also an almost throw away comment of a line which mentions a young trans male whom Lexi had previously interacted with at school. I've found many novels with trans characters where the story is so focused on their coming out and / or transition. While of course these novels are important, we need more representation like those in Clean showing normal young trans men and women just going about their lives. This is especially important in a time when the trans community are represented so unfairly and unkindly by certain media outlets and the bigots who buy their rubbish papers or watch their awful TV programmes and think they have the right to spew venom under the guise of free speech. 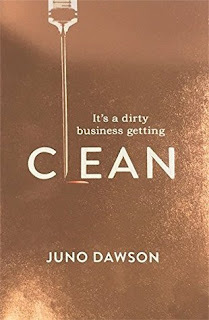 Hopefully with more portrayals like those in Clean in books, films and TV programmes things will start to change even if that change doesn't come about as quickly as we'd like. In short I loved Clean. It's addictive reading which had me hooked from the outset. Juno Dawson's best work to date.